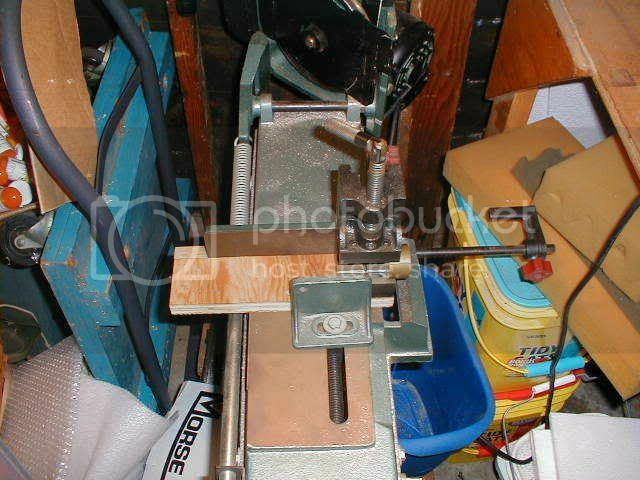 Like nearly every amateur metalworker, I have one of those ubiquitous 4 x 6 Chinese horizontal bandsaws. Also, like nearly every amateur, I'm cheap and like to use every last bit of material I have - it's not scrap until it weighs less than 5 grams. I quickly discovered that using the bandsaw to cut slices off very short pieces of stock was problematic. There's just no good way to hold a tiny remnant in the saw vise. So I came up with a solution that's been well received by my fellow club members and I'd like to pass it along here. 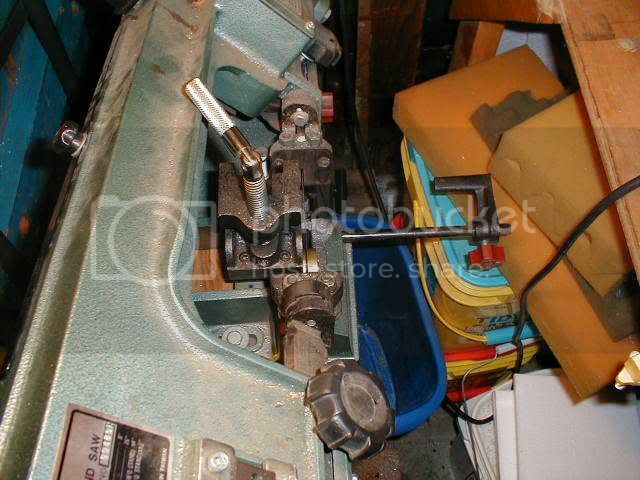 Take a cheap Chinese drill press vise and drill and tap the fixed jaw end so that it can be screwed to a board with some countersunk machine screws as shown in the first photo. 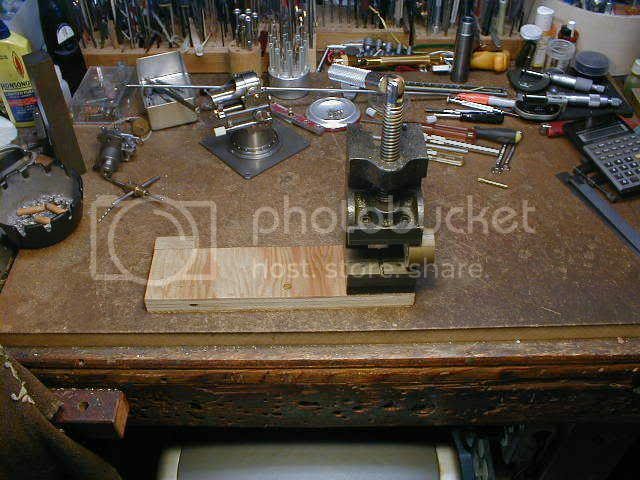 Grasp this board in the bandsaw vise so that the DP vise holding the short remnant stands vertically. The small wooden stop screwed to the back of the board locates the DP vise so that the bandsaw can drop down over it and the sawblade is about 1/8" from the right edge of the DP vise. With this arrangement I've been able to cut slices as thin as 1/16" from remnants only 1/2" long. A further advantage is that short pieces can be placed in the vise with an angle block and angled cuts made without the need to disturb the alignment of the bandsaw vise. Another good one, Marv. Keep 'em coming (he says as he quickly takes notes...). Great idea Marv! I had such a little vice in the drawer and it is now a part of my saw. Is there no end to the things you can do to those little saws? Best $175 I ever spent. i have one of those crappy little vises that i was going to toss in the bin at work, but not now! !